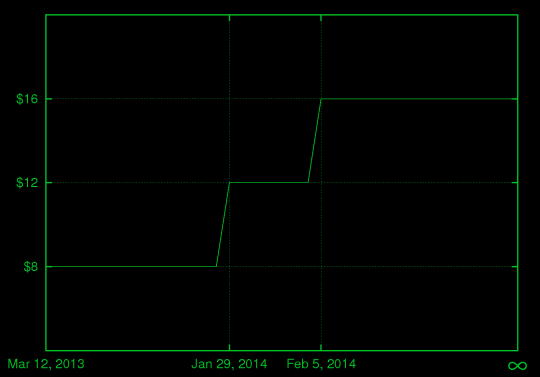 First, a bit of news: the Castle Doctrine has a confirmed Steam release date of January 29, 2014. The alpha will end at that point, along with the 50% discount. Over the years that I've worked on this game, I've done a lot of thinking about game pricing. I've been inspired by the way Minecraft pricing worked. Essentially, the price just kept rising over time. Of course, this flies in the face of the modern trends, from the race to the bottom in app stores, to the back-to-back Steam sales, to the super-lucrative bundles. Games generally start out expensive at release time, then get cheaper when they go on sale, and eventually become effectively free when they are put in a name-your-price bundle. And I totally get it. As a Steam developer, I've made much of my Inside a Star-filled Sky money during Steam sales. Sure, I made 25% of my lifetime Steam revenue during my launch week, but I made an additional 10% during my first sale, which happened only a few weeks after my launch. After that initial taste of extra, no-effort money, I participated in sale after sale. I was hooked. In the long tail, my daily revenue dwindled down to almost nothing, except during the sales, when there would be another big spike. I mean, making $3K over a few days, and a full year after launch? Hard to resist. In 2009, Steam had its first big sale. I'm guessing that they were blown away by how much money they made, because they followed that sale with three more sales the next year. These days, they have 5 gigantic sales each year, which means that a sale is pretty much always just around the corner. And even better, in between the sales, there are publisher sales and weekend sales and deals-of-the-day and so on. Something is always on sale. On its face, this seems like an obvious win for game developers: they get to revive their dwindling long-tail numbers with a big revenue boost, and a sale will bring more latecomer players into their games too. This also seems like a win for players: people who can't afford to buy a game at full price get a chance to play it later, for cheaper. The audience grows, and more people get to experience the game. Good stuff. But I suspect that something different is happening. Something that is arguably bad for players, and possibly bad for developers as well. To put it bluntly: sales screw your fans. Your fans love your games and eagerly await your next release. They want to get your game as soon as it comes out, at full price. But they are foolish to do that, because a sale is right around the corner. Even in economic terms, the extra utility of playing the game early, at release, is not big enough to offset the extra cost for most people . It makes more sense to wait, unless they love you and your work so much that they're willing to throw economic reason out the window. It's nice to have fans that love your work that much. And these are the fans that you kick in the teeth when you put your game on sale. But forget the fans for a moment. A culture of rampant sales is a culture of waiting. "I'll buy it later, during a sale." Launch weeks become weak, and developers grow to depend on sales for financial survival. Even in my example from above, 25% is a pretty sad launch week. In my case, that represented something like $23K. I made more selling the game through my own website. Pathetic. Of course, sale after sale, later on, pumped my revenue up to way more than what I made on my website. This waiting game is likely decimating your player base and critical mass at launch by spreading new players out over time. And your fans, who are silly enough to buy the game at launch and waste money, get to participate in a weaker, smaller player community. Finally, there's the possibility that the culture of sales actually reduces developer revenue over the long term. If just half of the players who buy the game during a 50%-off sale would have bought the game at full price if that was their only option, we'd already have a wash. What fraction of sale-waiting players fall into this category? I suspect way more than half. The picture gets even worse for 75%-off sales. To balance this out, we would need a whole lot of people who will buy random games just because they are on sale---games that they had no intention of buying otherwise. Maybe there are enough of these people, and I've certainly met some of them: people who have a backlog of 50 unplayed games in their Steam library. Maybe they'll never play them. But even if there are enough people doing this, it's not a good thing. It's just people being tricked into wasting money on stuff they don't want or need. Better that they spent that money on one full-price game that they really want rather than four 75%-off impulse buys to add to their backlog. All that said, I get why a culture of sales has blossomed, and I also get that it's impossible to escape from it now. To Valve's credit, they never force developers to put their games on sale. Of course, when most developers are putting their games on sale, it becomes harder for the remaining developers to make sufficient revenue without joining the sales, which means even more developers will put their game on sale, which means that players will know that pretty much every game will be available at a deep discount sooner or later, which means that more players avoid buying games at full price, and so on. But a bargain rack for physical retail makes perfect sense and is actually pretty great for everyone. Shelf space is limited, as are the number of available copies of a given game, and retailers need to eventually liquidate old games to make room for new ones. But the temptation for players to wait until it's on sale is weaker, because there's a good chance that an awesome game will sell out before it ever hits the bin. 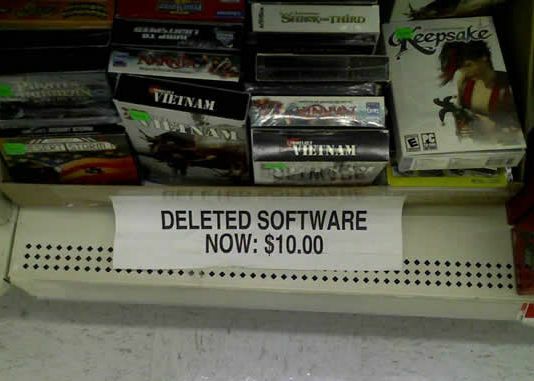 Just try finding a copy of Rez, Ico, or Rock Band 3 in the bargain bin. Some games even sell used for more than their original retail price. Other old games are almost impossible to find. Yes, there are some big, thin spikes there during the sales, but they are insignificant compared to the day-to-day full price volume. And how much thicker would that daily volume be if players weren't waiting for sales? Okay, but what are the alternatives? More importantly, how am I going to price The Castle Doctrine? If you buy it at launch, are you going to be screwed a few weeks later by a sale? Am I going to make you wish that you waited? Let's consider the implications of the Minecraft pricing model. What if, instead of inevitable sales as a game ages, the price rises over time instead? For the fans, this is a great thing, because their die hard fanhood is rewarded with a lower price, almost like a secret deal for those who knew about the game before anyone else. When the price goes up later, they feel smart. Most importantly, they don't feel torn between supporting their favorite developer at launch and saving money. They can do both. For people who find out about the game later, after the price has gone up a bit, they may regret not buying the game before the increase (a lesson learned for next time), but they can still feel smart buying the game now, before it goes up again. For the people who buy the game the latest, after the final, permanent price has been reached, they had the chance to wait to hear more about the game before buying. They had less to lose at that point, because the game has been vetted and the community established. But in general, people who missed lower prices in the past may not even be aware of what they missed. They come to buy the game now, and see the current price now. On the other hand, when your game goes on sale later, everyone who bought it at full price remembers what they paid and feels the sting. Being unaware of what you're missing has a different psychological impact than having what you missed thrown right in your face. Indeed, people gripe openly when they buy a game only to see it discounted next week. They even email developers and ask for refunds. Who complained when the price of Minecraft went up? No one, because the Minecraft pricing model also permits total openness about future pricing plans. You can safely announce, "The price will go up next week. This is the last week to get the lower price." This will create a huge revenue spike as people race to get the game---no problem there. However, if you're planning to put the game on sale next week, you can't announce it, because you will cannibalize this week's full-price revenues. Even worse, people who would decide to wait upon news of a forthcoming sale may forget to come back and buy the game later. They're at your website now, and you can't afford to scare them away now. So, you have to keep the forthcoming sale secret. You have to surprise people. And burn people. The worst case here is pretty awful: the sorry person who buys the game one minute before the surprise sale price kicks in. You're going to get an email from that person. So, the rising price model is really just an inversion of the sales model. You get revenue spikes later in the life of the game, right before announced price hikes, which are very similar to the spikes induced by putting a game on sale. But there are no surprises, so no one feels screwed by the process. In the case of The Castle Doctrine, the "ever rising" price model was a perfect fit for other reasons. As a massively-multiplayer server-based game, it required extensive testing before launch. I could reward those early testers with the biggest discount. Also, as a server-based game, each additional "copy" sold is not without cost to me: it's one more player logging into the server, and potentially one more player who will need tech support during an outage. I can't just pepper the ground with cheap or free download codes, because download codes are actually lifetime accounts. The final price of the game will be $16. During alpha testing, up through launch, the game has a 50% discount for $8. During launch week, the game will have a 25% discount for $12. After launch week, the game will rise to full price. In other words, this is the last two weeks to get the game at 50% off (ending January 28). If you want to wait until launch on Steam, you can get it for 25% off if you buy it during the first week (ending February 4). Otherwise, the game will be full price at $16 forever after that. Anyone feel burned by that plan?